These are the awesome Cathedral Quarry Caves near Little Langdale. 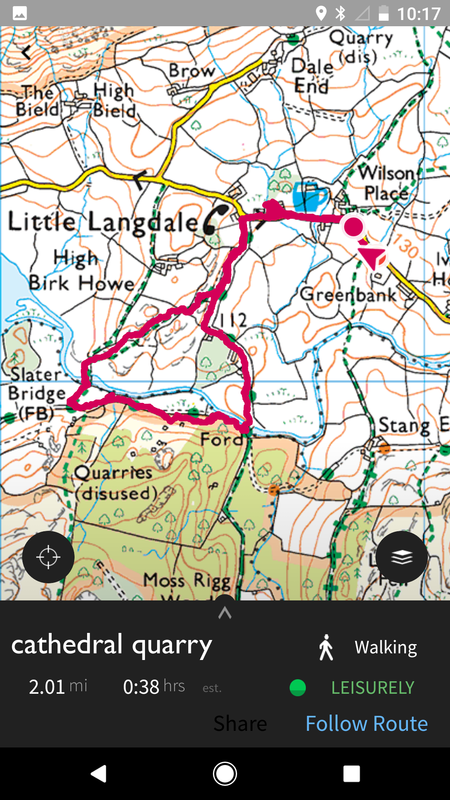 We parked on the side of the road at GR 319032 on OS map OL7. Get there early as it’s a narrow road with limited spaces. Walk up past the Three Shires Pub and take the footpath on the road to the left. After about 100 metres, take the footpath on the right, signed “Slater Bridge”. Cross this quaint little bridge and turn left on the footpath. After approx 50 metres you’ll see a stile on the right of the path which goes uphill. This leads to the entrance of the caves. A really impressive and easily accessible set of caves and mining shafts. Suitable for all ages and more exploring could be done by older children. Don’t miss the resident goldfish in the large puddle in the main cave! Make sure to also walk up and around the top, where there are other cave entrances and ruins of old slate houses which are perfect for little people. Take a torch and heed the warnings that there are steep drop offs and loose rocks etc. Once you’ve finished exploring the caves, make your way down and continue along the path to the bridge which is also a ford at GR315029 and finish the loop up to the Three Shires pub! Less than 2 miles and took us 2-2.5 hours. We had a picnic in the cave and explored for a long time there.